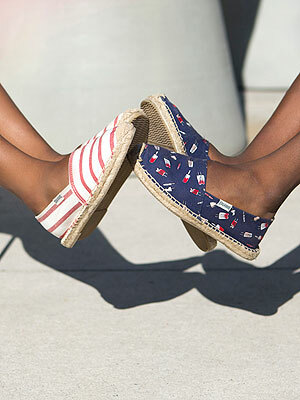 Nothing says summer more than espadrilles. Not only are they comfy and easy to wear, but they go with almost anything – dresses, shorts and more! So you can imagine our excitement when we learned that Soludos – the star-loved (Sienna Miller, Miranda Kerr, Naomi Watts) brand behind the chicest jute-soled shoes we’ve ever seen – was launching a collection for kids. Available in toddler (11-2) and big kid (2-8) sizes, it includes everything from bright solids and classic stripes to fun prints (popsicles, anyone?). We can just see our Mini Me hitting the park in the adorable Foxes Lace-Up ($42), which comes in aqua and coral. After checking out styles for your little ones, make sure to take a look at the latest grownup offerings. Already on our list: The Lace Flower Lace-Up ($55) and the Ombre Washed Rainbow ($36). To shop the full collection, go to soludos.com/kids.